If you stroll in the Chinese quarter (also called "Cheonggwan") at Bukseong-dong, Jung-gu, so picturesque and exotic, you feel you might run into uncle Wang from the olden song at any moment. At the heart of Incheon, yet in Chinatown You are in a faraway country. 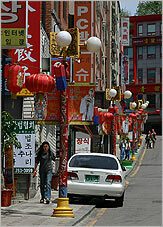 Incheon Chinatown, the only one in Korea, has been a popular place to visit since the Ching Dynasty's consulate opened in 1884. 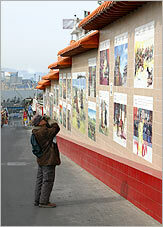 The establishment of regular ship routes between China's Shandong Peninsula and Incheon brought many Chinese who settled in Bukseong-Dong and Seonnin-Dong. Their numbers increased to 10000, and Bukseong-Dong became known as "Little China". Most of these Chinese sold imported Chinese food goods, salt and Korean gold. The area became known for its Chinese restaurants and stores. Incheon's Chinese population begin decrease in 1948, when changes in Korean laws caused a reversal of fortune among Chinatown's merchants. In 1949 the Chinese government placed a ban on their citizens traveling abroad. 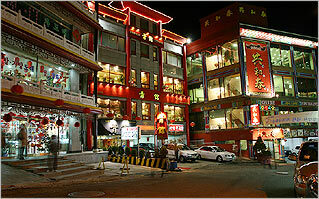 Now, a half-century later Incheon's Chinatown is undergoing a revival, thanks to a city urban renewal project. The business climate of today's Korea encourages foreign investment. Chinatown has been designated a special tourist district, linked to other tourist attractions, and the neighborhood is once again booming. 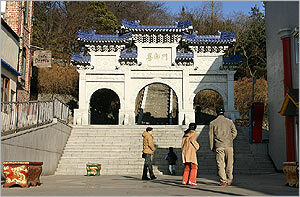 Chinatown's unique character is enhanced by three traditional-style gateways, a gift of the Chinese city of Weihai. Overlooking Chinatown is a statue of Confucius, the Great Chinese sage, a gift of Ching City in China and local ethnic Chinese schools. The Bukseong-Dong (municipal) office building was renovated using Chinese-style architecture. Today's Chinatown combines the past and present, providing an interesting and pleasant atmosphere for some relaxing sightseeing. Meanwhile, Chinatown itself has been excellently preserved. For example, Uiseondang, a shrine for the Chinese community and a former Kung Fu hall, the Chinese school still stand intact, giving the eerie impression of being caught in a time loop. Or Gongwhachun restaurant is where Jajangmyeon - the black bean paste noodle dish that is so popular in Korea - originated. A Chinese gate and the statue of Confucius, the latest additions to Chinatown, have now provided the neighborhood with an indelible exotic stamp. 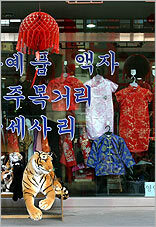 In China Town you can experience 100 years of history and culture of the Chinese community in Korea. Here you can taste authentic Chinese cuisine. Red signs in Chinese, traditional Chinese buildings create an atmosphere that makes visitors feel as if they are in China. Many movies are filmed here because of the special atmosphere and background. Bukseong-dong China-town is the place to go if you want to try Korean-Chinese food. Three traditional Chinese gates were donated by Weihai, Shandong of China, a sister town of Jung-gu of Incheon and are still grandly standing by the entrance of China Town. They were built at a cost of 200 million won. The consulate of Qing dynasty was placed on the hill, in 1884, where the whole Chinese residing place is beneath from it. The consulate was gone from long before now, but this became the Chinese school for the Chinese. The school building went through several reconstructions but still has the Chinese architectural style. The school is Incheon's only Chinese school, where Chinese traditions are taught to ethnic Chinese in Korea. It's pretty enlightening when you're with bilingual Chinese student there. A wall mural painting, based on the theme of Chinese traditional plays and history - is located next to the stairs leading up to the traditional Chinese gate known as "The Third Gate". This artistic panorama of Chinese culture unfolds as you climb up the stairs. The local municipal government (ward) office building - the Bukseong-Dong Office - is designed in a traditional Chinese architectural style with elaborate dragon sculptures. It was renovated, as part of the city's Chinatown urban renewal project, to reflect the neighborhood's unique Chinese character. Confucius, considered one of the world's great moral teachers, lived in China 2500 years ago, and is still highly revered there. He is famous for his many sayings such as, "If you enjoy what you do, you'll never work another day in your life." He once said, referring to Korea, "If I were to be born again. I would be born in the land of etiquette in the East." 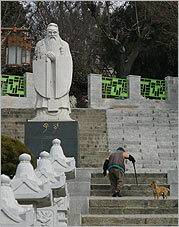 Today you can see statue of Confucius at the end of stairs to Jayu Park. The experience of ancient Chinese martial arts and philosophy will greet you inside this building, where Kungfu was once taught in Chinatown's early days. Incheon Korean-Chinese Cultural Center, located in Hangdong 1Ga in Jung-gu, Incheon, was organized to introduce Chinese cultures and related items to Incheon residents and other visitors and manages dynamic auditorium (video and performance) as an active promoter of cultures. From underground to the fourth floor, the Center is used to exchange the cultures and economics of Korea and China and to introduce Korea's partner cities in China. subway Incheon Station (1-st line), then walk (10 minute) to Second Chinese Gate. buses 2,5,15,23,28,32,45, bus-stop "Incheon Station", then walk. China Town has treasured the tastes of mainland China that are not found in common Chinese restaurants. You can meet many Chinese emigrants who speak half Korean and half Chinese and their cuisines. The new tastes with diverse Chinese culture allow the visitors to feel as if they have made a trip to China. You can taste original Jajangmyeon, one of the most popular dishes of the public, king dumplings, and moon rice cakes of Chinese Thanksgiving. "Pungmi", an authentic Chinese cuisine which has been serving food for 4 generations, "Jagumsung", famous for its teakettles which are about 1 meter long, "Wonbo", an authentic Chinese dumpling house, and many other distinctive Jajangmyun houses are located in the town. 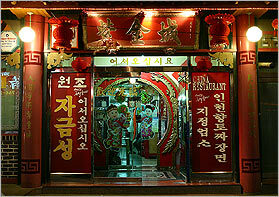 Opened in 1905, Gonghwachun was the first Chinese restaurant in Korea. It launched jajangmyeon, which became an all-time favorite dish of Korean people for the next hundred years. A "sacred site" for Korea's jajangmyeon lovers, the Gonghwachun building is also a noteworthy monument architecturally. It is the oldest existing Chinese restaurant building, a beautiful example of the Chinese construction style. This high-profile gastronomic venue, once drawing endless crowds of Chinese trading merchants and Korean gourmets from all over the country, and now long since closed, stands amid relics of its past prestige, bearing witness to the tumultuous history of Chinese immigrants in Korea. China Town is the home of Jajangmyeon, many people's all-time favorite. Noodles mixed with stir-fried soy sauce paste was first introduced as a low-price and easy-to-make dish for the commoners. There are various kinds of Jajangmyeon in Incheon's China Town. "Yetnal Jajangmyeon" is an original taste and all time favorite. Also popular are stir-fried "Gan Jajang", Sacheon Jajang with red pepper oil, and "Jaengban Jajang" that comes in a big plate for more than two people. If you enjoy sea food in your noodles try "Samseon Jajang", and "Yuseul Jajang", for more vegetables. Even today, this "Little China" is always packed with visitors coming to try the original Jajangmyeon. Most Koreans consider it a Chinese dish, but actually this menu item doesn't even exist in China. It is a traditional Chinese bread that resembles the great land of China in the appearance, but press it and it shrinks, because there is nothing but air inside. This traditional Chinese cookie is sweetened with honey, giving it a delightful smell as well as taste. A king-size Chinese dimsum with all kinds of nutritious ingredients in generous portions makes it a meal in itself. It's prepared with healthy and abundant ingredients will make you full without any other dishes. Wolbyung are cookies from ancient China (transmitted from Southern Sung Empire), made in the shape of a full moon. At the time of the Mid-Autumn Festival (on Aug 15-th of lunar calendar), also known as the Moon Cake Festival, people give these cookies as gifts, wishing each other good luck. Yongiung tea is the best of all the Chinese green teas, and has been enjoyed for thousands of years. Near or alter April 5, the original green tea, freshly made, costs as much as hundreds of thousands of won per bottle. Yongjung tea, which Chinese people love to drink every day, is excellent for general good health and losing weight. This tea is for people who know how to enjoy good conversation and good tea. 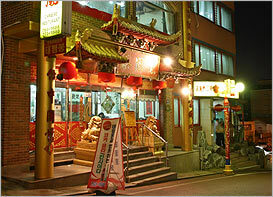 In addition to various restaurants China Town has a lot of stores which selling Chinese goods and souvenirs. For instance, "Joonwha Yeawon" - a Chinese art store, "Joongwhung Store" - a Chinese miscellaneous store selling colorful Chinese clothes, tea, and dolls, and other stores selling Chinese products are also nearby. Among them - "Bokraechun". This store was first established in 1900, and since then has sold the famous lame bread and other miscellaneous goods from China such as Chinese teas, vessels for Jesa, rice cake and etc. The current owner is Kok Hae-Ok, and his grandfather built that store, he said. a popular item placed in Chinese houses on holidays. Based on the Chinese belief that the color red lights the world, the famous red lantern is a classic fixture of traditional Chinese culture. beautiful traditional clothing. As with the Korean Hanbok and the Japanese Kimono, the traditional Chinese women's clothing is the Chipao. The fabric is smooth, natural and elegant in its design. It conies in various colors and shapes. China is one of one places where the world's earliest brewing skill developed. As far back as 4000 years ago, various crops were brewed to make alcoholic beverages. The tastes of traditional Chinese alcohol differs depending on brewing methods and ingredients used. The Jajangmyeon Festival is yet another delightful feature of China Town. Including Gonghwachun, the first Jajangmyeon restaurant in Korea, the food festival is participated in by dozens of Chinese restaurants that have been there for decades. Some restaurants only charge 1,000 won for a bowl of Jajangmyeon. They are planning to add some traditional Chinese performances like dragon and lion dances as well as Chinese plays. The festival is a three-day event in October, taking place in the Chinese Street and Freedom Market, and sponsored by Incheon City. Many local people, as well as tourists, join with Chinese people in promoting and celebrating Chinese culture, and creating a better understanding of China. Performances and displays make this an exciting culture and entertainment event. subway Incheon Station (1-st line). Here there are entrance in China Town (First Chinese Gate) and Tourist Information Centre. buses 2,5,15,23,28,32,45, bus-stop "Incheon Station".